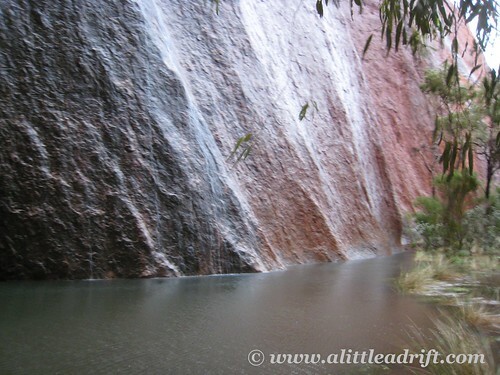 Rain alternated between a deluge and a misty-drizzle the entire first day on our Outback tour – and incredible luck meant we not only witnessed the waterfalls on Uluru (Ayres Rock), but also, a briefly visible rainbow as the last light of the day lit the rock a glowing orange. On the flip side though, the rain also meant that we missed hiking Kata Juta, we were often stuck inside the bus for incredibly long periods of time, our guide had to beg for tents instead of swags (open-to-the elements canvas sleeping bags) for our camping needs and we were all getting a bit of cabin fever by the end of only the first day. All of this sounds like a right bit of whining, right? I mean, nothing had gone according to plan. We were soggy from the rain and cold because we hadn’t anticipated it would be raining day and night. But that’s where it comes down to personal choice. You choose the experience you want to have. influences your level of enjoyment. Every single one of the 21 people on our tour bus had to make a choice: do we spend three days hating our luck and making life miserable, or do we really and truly, even when it’s incredibly difficult, try to find some ways to lighten up and make it fun. By and large we made valiant efforts to not let the group mentality shift toward the negative. And that’s not to say that we didn’t have a couple of complainers, because out of 21 people, let me assure you that we did. But the group mentality stayed positive…even when we emerged, dripping wet and soaked to the bone from a two hour walk/swim around the base of Uluru. That’s right, day two of the tour traditionally involves a glorious sunrise over Uluru and then Uluru’s two hour long base walk, followed by climbing the rock for those tourists who have absolutely no respect for the Aboriginal culture and their request not to do it (and yes, that’s my very blatant opinion that you shouldn’t do it. People do, lots of people, but the Aboriginals ask you not too – and it’s their rock, and it means a whole lot more to them and their culture than it does to me, so I would have respected the request even if it weren’t raining and impossible to climb…and I’m done with the rant now). 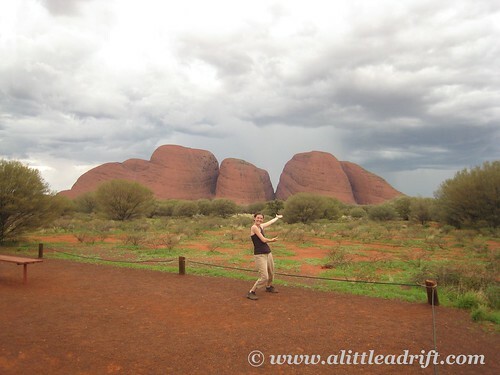 So Jess dropped us off at the at one side of Uluru and with a quick wave and sped down the road to our rendezvous point on the other side of the rock…leaving us with only one effective way to the other side: navigate the two hour base walk. At first the ground was merely a thick, pasty mud with pockets of water that were easily avoidable. Then, we fully gave up hope of keeping our boots dry as the water rose to ankle deep. At this point several in the group protested hotly and, with a bad attitude plastered all over their faces, turned around to try to hitch back to the bus. 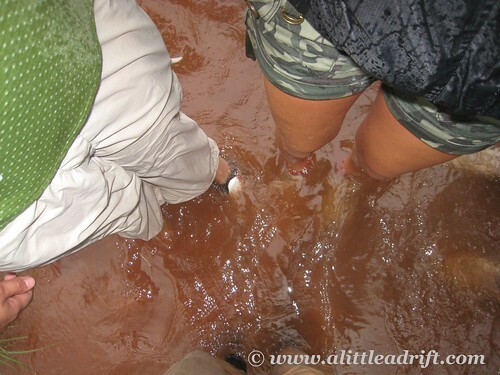 For those of us who soldiered on…next came the waist deep stream crossings. I’ll not lie and say that the dozen of us who waded around the base of Uluru maintained a positive attitude the whole time, but we did make it a game. And by the time the water was nearing waist deep, can you really do much else than laugh and see the hilarity in the situation? My conclusion? 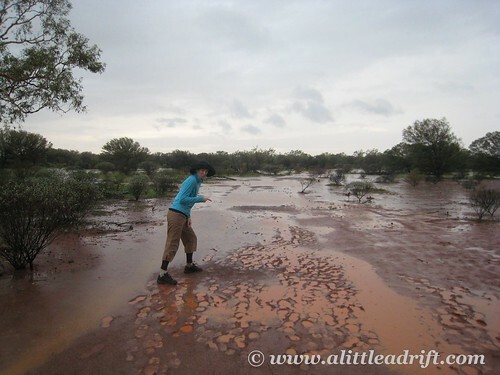 One lesson learned, and one more solidified: Don’t walk Uluru’s base walk in the rain and you choose your own experience. Have you ever faced an unlucky situation and made the choice about what kind of experience you were going to have? Good for you, Shannon. I also did this walk, but not in floods like you! Had the good fortune to o and spend three days in an Aboriginal settlement out in the bush too just after that. Amazing privilege to be able to spend time with some indigenous people and find out more about how they survive in a pretty forbidding landscape and climate. 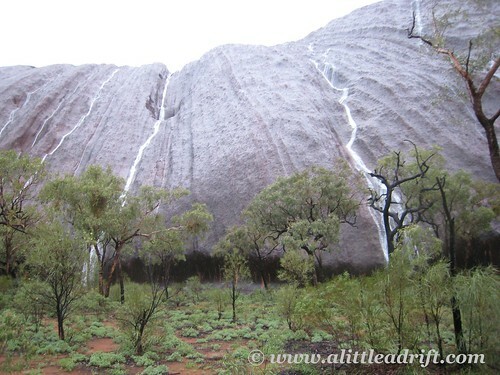 It was also raining when I visited Uluru, but not to the extent that you describe. Keeping positive when traveling is definitely an absolute necessity – and things will go wrong – and your attitude can serioulsy impact everyone around you. Good for you, you didn't want to climb: if we don't respect the culture of the countries we are visiting there's no point in visiting them at all. and for the record, I'm jealous about Iguaçu Falls – it's on my bucket list! What a story! I agree with your perspective: there is nothing that can be done about many things that occur while traveling — especially when it comes to weather! The best thing to do is try to maintain a sense of humor and adventure. I agree 100%, and hey, you got a pretty awesome adventure story out of it. I hate complainers, they always ruin a trip. That second picture is SO great. Great post! You're so right Shannon – attitude is a choice we make – I agree that sometimes the best thing to do is to just make the best of a bad situation and try to view it as a source for good stories later (especially when there isn't much else you can do anyway! ).